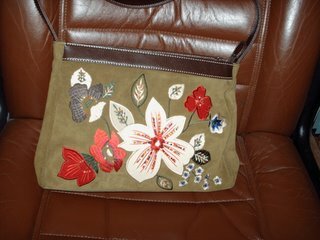 The rest of the purse is an olive suede and vinyl. You can find inspiration almost anywhere, even in a thrift store "). Next: Scrapbook cover for Dad, appliqued onesies for baby shower, more beaded hairsticks for my Etsy shop. What a score that was! Yep, not too bad for $1.99, huh? I had appliqued three felt oval circles - turquoise, purple and pink with the name of the baby embroidered stitched on the top one and handstitched with embroidery thread on a cute top half of an 18-month-old skirt set - but forgot to take a picture of it as the baby shower was the same day. Got this idea from belladia.typepad.com site. A cute and easy baby shower gift.